Tims, Ricky – Offers hand-dyed fabrics, thread, CDs and supplies. 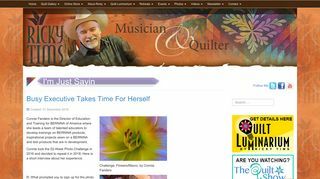 Includes a gallery of the artists quilts, biography, and workshop information. – Offers hand-dyed fabrics, thread, CDs and supplies. Includes a gallery of the artists quilts, biography, and workshop information. Ricky’s has made quilts that have won numerous international awards. He began designing and making quilts in 1991, and was recently named as one of The Thirty Most Distinguished Quilters in the World.